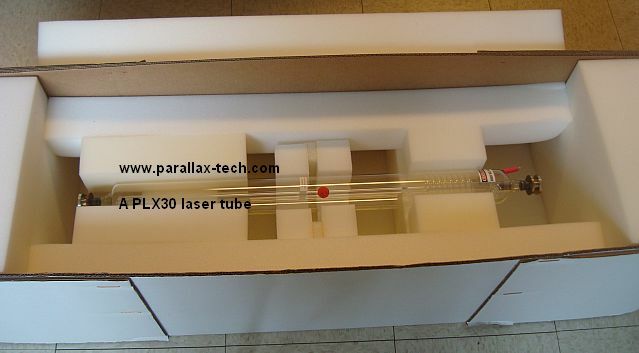 As most of you know, safe shipment of long and fragile laser tubes is a challenge. Many of you do your best to package the tube as safe as possible with the AVAILABLE packing material on hand. Unfortunately, many a times, that is not good enough and the laser tube arrives here damaged. These photos are taken on arrival here and show the depth of the problem. To alleviate this problem, we are now offering our own laser boxes for sale to all Biotechs who need to send in tubes for service and to our own customers who have discarded their original Parallax box. Boxes come in 2 lengths, 49 inches long and 73 inches long and they have excelent record for international and domestic travel and even FedEx / UPS ground travel ! Most short medical co2 laser tubes like Sharplan and DEKA Smartxide DOT fit in the shorter box and all long laser tubes like Paragon and Surgilase tubes and all industrial tubes fit in the long box. Please note; we require that you pre pay for the box and for box shipment to your location with a credit card or through PAYPAL. If you have done business with Parallax before, you may use your own shipping account number. No exception. Boxes only ship prepaid and either one costs $150. WE CHARGE YOU $300 FOR THE BOX BUT THEN WE SUBTRACT $150 FROM YOUR INVOICE WHEN YOU SEND YOUR LASER TUBE FOR REFILL. This is so that we don't keep on sending our laser boxes for other purposes and people who just want a padded box to ship something fragile. We are sorry but we can NOT 'rent a box' or 'lend a box'. These boxes are tools of our trade and after you purchase one, it will be a useful tool in your business. And while we are on the subject of BOXES, we have other Long Telescopic Boxes in our surplus-goods-for-sale pages. Check them out.